A Film Noir style shot, backlit through a bed sheet, and lit from the front by shaping flash light with a pizza box. Very much in the spirit of a low budget noir style movie. 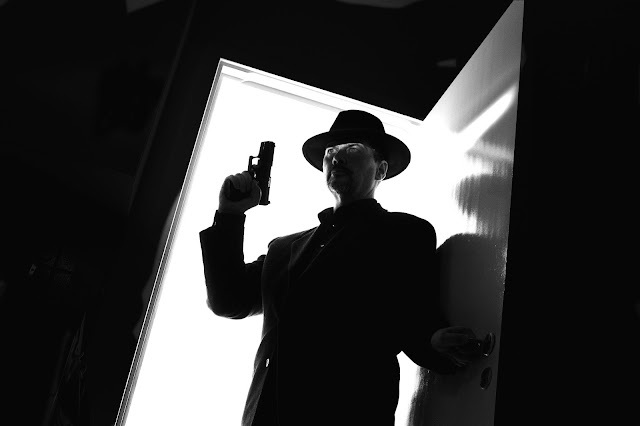 In a previous post I showed how to create a backlit Film Noir style photo using a bed sheet hung in a doorframe as a large softbox. That worked, but the resulting photo was a silhouette. A bit dark even for a noir style photo. Lighting the eyes a bit would make the photo come alive. How do you do that with a hotshoe flash without also lighting the entire room, and destroying the deep shadows? You need a thin sliver of light, aimed at the eyes. 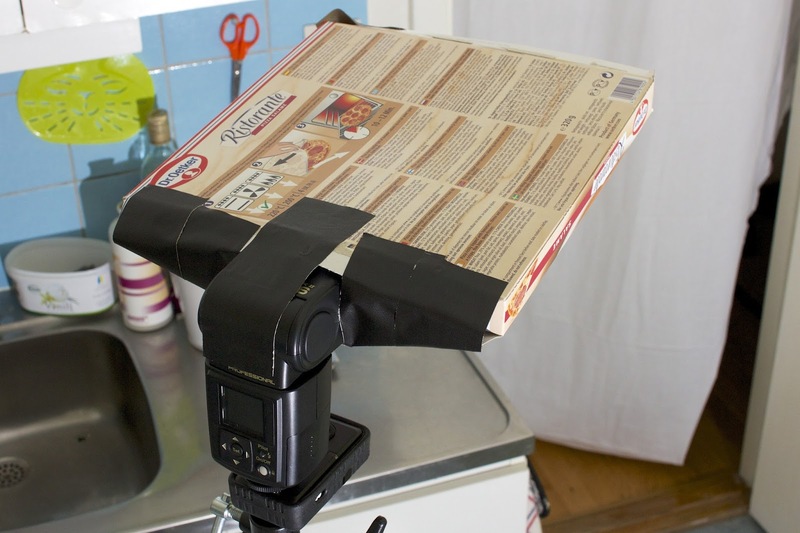 Since I did this in the middle of the night, I could not go to the photo store and buy an expensive light modifier. I had to get creative, and find something that could shape light the way I wanted. A pizza box and some gaffer tape made an excellent light shaper. 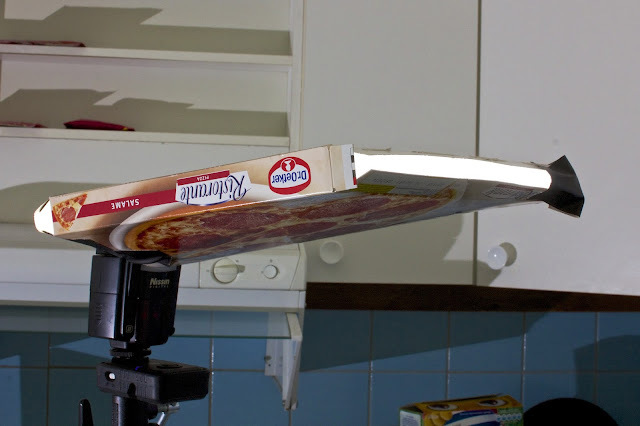 A pizza box had the right size and shape, so I brought out the gaffer tape and used it to mount the pizza box on a flash. I put the flash, with a radio trigger, on a lightstand, and was ready to go. The pizza box gobo in action. I added an extra piece of gaffer tape on the right side to eliminate some light that was hitting the wall instead of my eyes. It took a couple of tries, but when I had adjusted the height of the lightstand, it was pretty easy to hit my eyes with the flash. I started with the flash on 1/64 of full power, and turned it up little by little. Easy to do, took a couple of minutes, but it made a lot of difference to the photo. Check out the original silhouette version, and you will understand what I mean.